mobile number to text re. attendance 07585913605 & use on outings, woodland nursery days, stable days or Travelling Tuesdays. News update – April 2019. Please keep up to date with your child’s learning journey. If you need help to access your child’s learning journey please speak to your key person. Please keep this newsletter handy to check dates often! Tuesday 23rd April First day back after Easter holiday. Thursday 25th April Cooked lunch for children aged 2 and over who attend on this day. Please book in with staff. £2 to include main course, pudding and drink. Tuesday 30th April Travelling Tuesday! At Framlingham Scout HQ – deliver and pick up your child at normal times. See separate information below. School cohort to visit Mills Care home, Framlingham for intergenerational activities. Thursday 2nd May Outing to Framlingham Castle – more details to follow. If a child does not usually attend on Thursday they can join us if accompanied by a parent/carer. Friday 3rd May Cooked lunch for children aged 2 and over who attend on this day. Please book in with staff. £2 to include main course, pudding and drink. Tuesday 14th May Travelling Tuesday! At Framlingham Scout HQ – deliver and pick up your child at normal times. See separate information below. Monday 20th May Cooked lunch for children aged 2 and over who attend on this day. Please book in with staff. £2 to include main course, pudding and drink. Wednesday 22nd May Water confidence session at Elder Hall, Peasenhall, IP17 2HG Any time from 2pm to 3.30pm. This is an optional drop in session that parents and their Playschool children are invited to. Children must be accompanied into the water. Michele will lead songs/games in the pool to help your child build confidence in the water so they are then ready to learn to swim when the time comes. Friday 24th May Last day of this half term. Wednesday 29th May Holiday playscheme day. Normal fees apply or stretched funding. LIMITED SPACES AVAILABLE. Book your child in with staff. Thursday 30th May Holiday playscheme day. Normal fees apply or stretched funding. LIMITED SPACES AVAILABLE. Book your child in with staff. Friday 31st May Holiday playscheme day. Normal fees apply or stretched funding. LIMITED SPACES AVAILABLE. Book your child in with staff. Monday 3rd June First day of this half term. 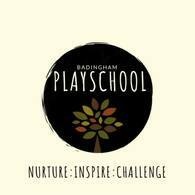 Tuesday 4th June Professional photographer at Playschool to take individual and group photos of the children – please book in from 8.30am. ALL WELCOME. This is a great fundraiser for Playschool so please support if you can. Monday 10th June Woodland Nursery! At Red Barn Farm, deliver and pick up your child at normal times. See separate information below. Tuesday 11th June Woodland Nursery! At Red Barn Farm, deliver and pick up your child at normal times. See separate information below. Wednesday 19th June Water confidence session at Elder Hall, Peasenhall, IP17 2HG Any time from 2pm to 3.30pm. This is an optional drop in session that parents and their Playschool children are invited to. Children must be accompanied into the water. Michele will lead songs/games in the pool to help your child build confidence in the water so they are then ready to learn to swim when the time comes. Tuesday 25th June Woodland Nursery! At Red Barn Farm, deliver and pick up your child at normal times. See separate information below. Wednesday 26th June Woodland Nursery! At Red Barn Farm, deliver and pick up your child at normal times. See separate information below. Thursday 27th June Woodland Nursery! At Red Barn Farm, deliver and pick up your child at normal times. See separate information below. Tuesday 2nd July Cooked lunch for children aged 2 and over who attend on this day. Please book in with staff. £2 to include main course, pudding and drink. Wednesday 3rd July Water confidence session at Elder Hall, Peasenhall, IP17 2HG Any time from 2pm to 3.30pm. This is an optional drop in session that parents and their Playschool children are invited to. Children must be accompanied into the water. Michele will lead songs/games in the pool to help your child build confidence in the water so they are then ready to learn to swim when the time comes. Friday 5th July Woodland Nursery! At Red Barn Farm, deliver and pick up your child at normal times. See separate information below. Monday 8th July Woodland Nursery! At Red Barn Farm, deliver and pick up your child at normal times. See separate information below. Tuesday 9th July Woodland Nursery! At Red Barn Farm, deliver and pick up your child at normal times. See separate information below. Thursday 11th July pm Annual meeting for parents & carers of Playschool children – save the date – more details to follow. All welcome. Wednesday 17th July Cooked lunch for children aged 2 and over who attend on this day. Please book in with staff. £2 to include main course, pudding and drink. Monday 22nd July Last day of term. Parents & carers invited to join us for sports, songs & refreshments 9.30am to 10.30am in the village hall. All welcome – if your child doesn’t usually attend on a Monday just bring them with you at 9.30am to join in. Tuesday 23rd July Holiday playscheme day at the Woodland Nursery! At Red Barn Farm, See separate information below. Normal fees apply or stretched funding. LIMITED SPACES AVAILABLE. Book your child in with staff. Wednesday 24th July Holiday playscheme day at the Woodland Nursery! At Red Barn Farm, See separate information below. Normal fees apply or stretched funding. LIMITED SPACES AVAILABLE. Book your child in with staff. Tuesday 30th July Holiday playscheme day. Normal fees apply or stretched funding. LIMITED SPACES AVAILABLE. Book your child in with staff. Wednesday 31st July Holiday playscheme day. Normal fees apply or stretched funding. LIMITED SPACES AVAILABLE. Book your child in with staff. Thursday 1st August Holiday playscheme day. Normal fees apply or stretched funding. LIMITED SPACES AVAILABLE. Book your child in with staff. Monday 5th August Holiday playscheme day at Bruisyard Road Stables, See separate information below. Normal fees apply or stretched funding. LIMITED SPACES AVAILABLE. Book your child in with staff. Tuesday 6th August Holiday playscheme day at Bruisyard Road Stables, See separate information below. Normal fees apply or stretched funding. LIMITED SPACES AVAILABLE. Book your child in with staff. Wednesday 7th August Holiday playscheme day at Bruisyard Road Stables, See separate information below. Normal fees apply or stretched funding. LIMITED SPACES AVAILABLE. Book your child in with staff. Monday 12th August Holiday playscheme day. Normal fees apply or stretched funding. LIMITED SPACES AVAILABLE. Book your child in with staff. Tuesday 13th August Holiday playscheme day. Normal fees apply or stretched funding. LIMITED SPACES AVAILABLE. Book your child in with staff. Wednesday 14th August Holiday playscheme day. Normal fees apply or stretched funding. LIMITED SPACES AVAILABLE. Book your child in with staff. Monday 19th August Holiday playscheme day at Bruisyard Road Stables, See separate information below. Normal fees apply or stretched funding. LIMITED SPACES AVAILABLE. Book your child in with staff. Tuesday 20th August Holiday playscheme day at Bruisyard Road Stables, See separate information below. Normal fees apply or stretched funding. LIMITED SPACES AVAILABLE. Book your child in with staff. Wednesday 21st August Holiday playscheme day at Bruisyard Road Stables, See separate information below. Normal fees apply or stretched funding. LIMITED SPACES AVAILABLE. Book your child in with staff. Tuesday 27th August Holiday playscheme day. Normal fees apply or stretched funding. LIMITED SPACES AVAILABLE. Book your child in with staff. Wednesday 28th August Holiday playscheme day. Normal fees apply or stretched funding. LIMITED SPACES AVAILABLE. Book your child in with staff. Thursday 29th August Holiday playscheme day. Normal fees apply or stretched funding. LIMITED SPACES AVAILABLE. Book your child in with staff. Monday 2nd September First day of the Autumn Term. If your child is unwell he or she needs to be at home with you for their own good and to stop the spread of disease to other children or staff. They MUST NOT return to Playschool until 48 hours after they have stopped diarrhoea or sickness. If your child needs Calpol – they should not be at Playschool – Playschool is a busy environment and they will recover better and quicker if they have a quiet day at home. . PLEASE INFORM PLAYSCHOOL OF REASONS FOR ANY ABSENCE. Please remember children need to be dressed in suitable clothes for the weather and ones that will be OK to get dirty! Please send in a complete change of clothes, so that if they get wet/muddy we can change them for the rest of the day. All children need a rain coat, hat and wellies every day. We do have a VERY limited supply of spares but not enough for all. Please clearly label your child’s things. We request that children don’t bring toys or unnecessary possessions into Playschool as staff cannot be responsible for them and they may constitute a risk to other children. Reminder: we cannot refrigerate children’s lunch boxes they may need an ice-pack to keep contents fresh. The push for really healthy lunch boxes continues. Staff will not allow children to have sugary drinks, crisps, sweets, cakes or chocolate, unless it is a special occasion, so please do not include them in their lunch boxes. If you do include them staff will remove them from the lunch box and return them to you at the end of the session. Please speak to staff if you have any questions about this. With the kind permission of the Scouting/Guiding organisations in Framlingham we will be using the Scout HQ every other Tuesday through the winter months. This will give us opportunities to extend the children’s learning in ways that would be difficult to achieve in Badingham, e.g. we will visit shops, the library and the castle grounds as well as using the Pageant field as our outside play area! · Telephone number to contact us at the Scout HQ is the mobile number at the top of this newsletter. Address: Red Barn Farm, Framlingham Road (B1120), Badingham, IP13 8JN– turn into the farm driveway (beside the bungalow and letter box), half way along the drive bear right onto the grass track, drive past the farm house on your left and then turn sharp right down the hill to the grass carpark. Our woodland nursery will be in front of you. Adults please wear suitable footwear to bring your child into the woods. SPEED LIMIT ALONG THE FARM DRIVE TO AND FROM THE WOODS IS STRICTLY 5MPH. Allow sufficient time when dropping off/picking up so you don’t have to rush. It is essential that children bring or wear suitable clothes for spending a whole day outside. They must wear long sleeves and long trousers, whatever the weather, to prevent scratches and insect bites, and wellies/stout shoes (not flip flops or sandals). We can provide waterproof suits if it is raining/cold but all children need a coat and hat (suitable for either hot/cold weather). Playschool will provide a drink and snack morning and afternoon for over 2 year olds. In the event of extreme weather you will be redirected from the main driveway to a barn in the main farmyard where we will set up the nursery for the day. Telephone number to contact us at the woods is the mobile number at the top of this newsletter. Playschool will be using this Stable yard on the edge of Badingham village for some Playscheme days. 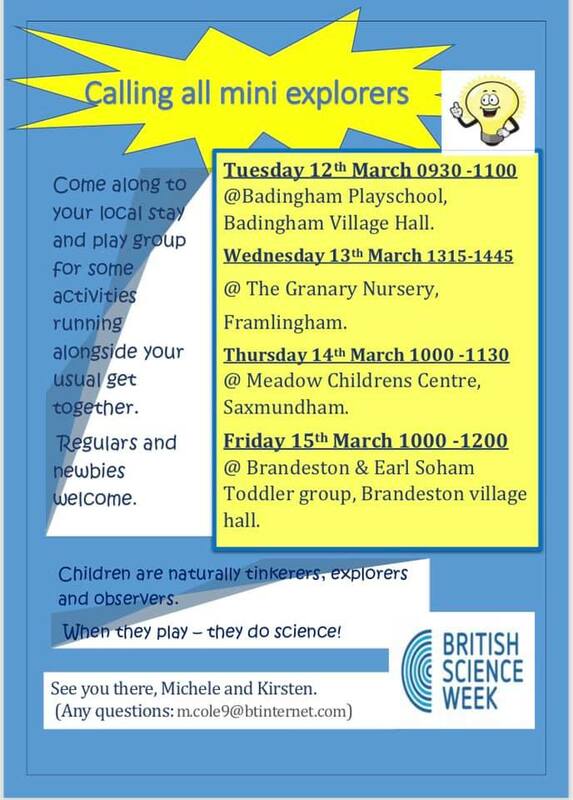 This will give us opportunities to walk through fields and footpaths between Badingham and Bruisyard, take part in pond dipping and lots of bug hunting whilst playing in the meadows. It is essential that children bring or wear suitable clothes for spending a whole day outside. They must wear long sleeves and long trousers, whatever the weather, to prevent scratches and insect bites, and wellies/stout shoes (not flip flops or sandals). We can provide waterproof suits if it is raining/cold but all children need a coat and hat (suitable for either hot or cold weather). Telephone number to contact us at the stables is the mobile number at the top of this newsletter. Travelling Tuesday! At Framlingham Scout HQ – deliver and pick up your child at normal times. See separate information below. 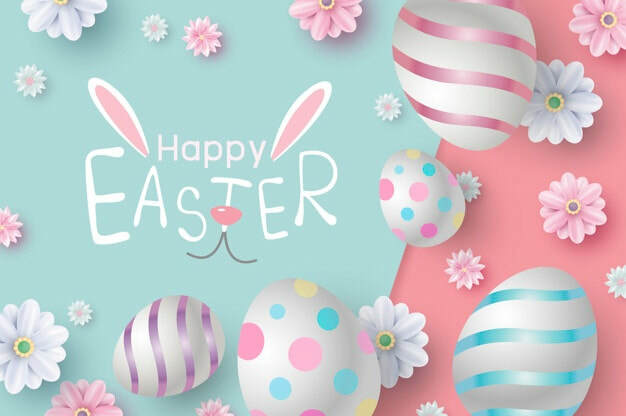 Easter Challenge – Parents/Carers & younger siblings are invited to join us for an Easter egg hunt/obstacle course on the Pageant field from 9.30am. Followed by songs and refreshments in the Scout HQ – finishing at 11.30am. No charge for Tuesday morning children. If your child does not usually attend on Tuesday morning you are welcome to bring them along to stay & play with us for £2 per family – please book in with staff. Wednesday 3rd April Last day of term. Holiday playscheme day. 8.30am to 4.30pm. Normal fees apply or stretched funding. LIMITED SPACES AVAILABLE. Book your child in with staff. Holiday playscheme day. 8.30am to 4.30pm. Normal fees apply or stretched funding. LIMITED SPACES AVAILABLE. Book your child in with staff. Travelling Tuesday! At Framlingham Scout HQ – deliver and pick up your child at normal times. See separate information below. Tuesday 23rd April First day of the Summer Term. 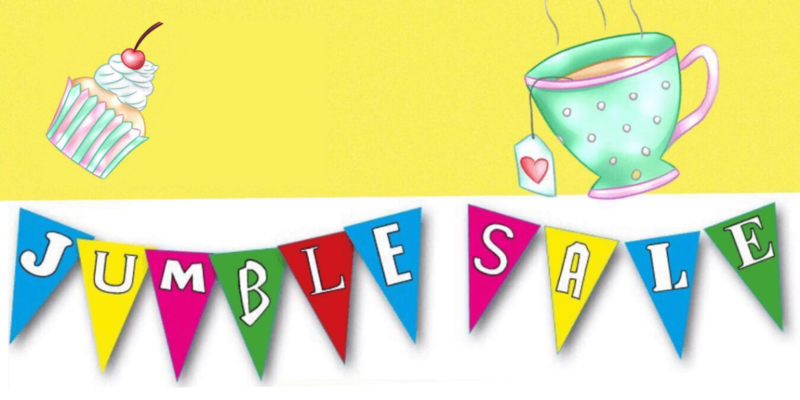 Jumble sale at Framingham scout hut. Entry: 50p for adults. Free for children. All items 50p or £1! Come and grab a bargain. ​Maybe a last minute outfit for world book Day?! Tuesday 8th January Travelling Tuesday! At Framlingham Scout HQ – deliver and pick up your child at normal times. See separate information below. Friday 15th February Last day of this half term. Holiday playscheme day. Travelling Tuesday! At Framlingham Scout HQ – deliver and pick up your child at normal times. See separate information below. 8.30am to 4.30pm. Normal fees apply or stretched funding. LIMITED SPACES AVAILABLE. Book your child in with staff. Monday 25th February First day of this half term. Make your bird mix. Allow the lard to warm up to room temperature, but don't melt it. Then cut it up into small pieces and put it in the mixing bowl. Add the other ingredients to the bowl. Mix them together with your fingertips until the fat holds the squidgy mess together. Now group your cones together and loop the string around the top of them. 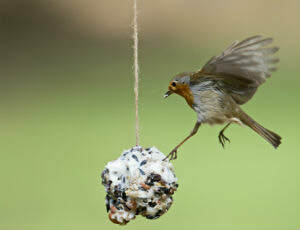 Then pack the sticky bird mix around the cones with your hands, creating a ball shape. Put your cones in the fridge to set for an hour or so. After that, they'll be ready to hang up and are bound to bring the birds flocking.